A few days ago, I hopped up onto my soapbox for a bit, because I was just so frustrated with the sizing and modesty of swimwear for our girls. Alright moms. Let’s have a serious talk here. 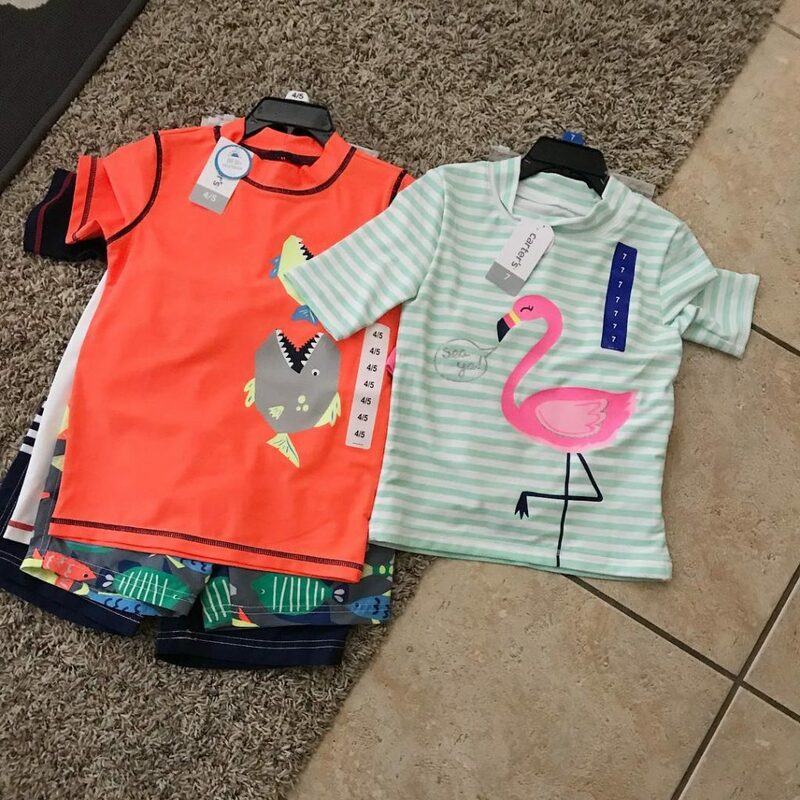 I just bought these two swimsuits for my kids. Nathan’s is on the left. Emily’s is on the right. His is a size 4/5. Hers is a size 7. SEVEN. So can someone please tell WHY ON EARTH the size 7 (of the exact same brand of clothing, mind you) is so much smaller in the girl’s size? You can’t even see the bottoms because they are tiny and hidden behind the shirt. Look how the boys shorts stick out because they are huge and cover up what should be covered when you’re 5. Listen. I want my girl to have a girly swimsuit with ruffles and cute designs. But can someone please explain to me WHY the boys swimsuits cover their bodies comfortably, and the girls swimsuits are actually MADE SMALLER so they fit tightly and essentially show off their innocent little bodies? And for the record, I bought the MOST modest girls suit I could find. I don’t get on my soapbox very often but for goodness sake, when you look at them side by side, this is ridiculous. The clothes available for my seven year old girl are significantly smaller than the clothes available for my four year old boy. Why? Dear clothes companies, is there any way we could refrain from oversexualizing our little girls until they are, I don’t know, adults who can make their own choices? Not to mention the self-confidence lost when my THIN, PERFECT seven year old feels bad about herself because she is “too big” for the tight clothing in her size?! What is going on here?! Come on, Carter’s – I just really think we can do better than this. And Target Style I’m looking at you, too, with those tiny little Cat and Jack bootie shorts you’re trying to pass off as appropriate clothing in the girls section. Nope. Not buying it. On a related note, I’d love any recommendations for cute swimsuits for girls that actually cover their bottoms, keep them protected from the sun, and still let them look like seven year olds. Please and thank you. Not only did a drove of moms chime in and say, “YES! Why is this so hard? !”, you guys also volunteered some great recommendations for places to find modest (but CUTE!) swimwear for our girls. I spent many, many hours looking through all those recommendations, and I’ve narrowed it down to a few fabulous companies I think all moms will LOVE. Most of these suits can even be ordered on Amazon, and delivered to your doorstep within 48 hours. God bless Amazon Prime. This is our top choice, and we ended up ordering a few mix and match items that we LOVE. They carry long and short-sleeved tops, skirt bottoms, and swim shorts. The patterns all coordinate, so you can really mix and match with ease. We purchased 2 skirts, 3 shirts, and one pair of shorts, and can mix them into any combination as they all go together! The skirts have swim bottoms underneath that are actually shorts, not bikini bottoms. This provides SO MUCH COVERAGE! And the skirts themselves completely cover her, reaching almost halfway down her thigh. Everything is made with this extremely light weight material that’s a lot softer than regular swimwear. It’s super comfortable. The material provides UPF 50+ rating protection against harmful UV rays. This is a big deal for us, since my kids burn super easily. They have swimwear for kids, toddlers, and babies. Plus a line of clothing for adults as well! In our experience, these suits run a little large – I will be exchanging Emily’s usual Medium for a Small, which still gives her plenty of room to grow. Shop Coolibar for Kids HERE. Shop Coolibar for Adults HERE. These suits are comparable in style and protection to Coolibar. Actually, we had a few of these last year, because Costco carried them. (Come on Costco, bring these back!) They are super cute, and come with hats. The skirts have drawstrings, making them adjustable – HALLELUJAH! The material provides UPF 50+ rating protection against harmful UV rays. These suits are often available in 3 piece sets, which tends to be a more affordable option. Note: these only go up to size 7. These are fabulous options that provide a little style, great protection, and appropriate coverage for our girls! Lands’ End – I actually bought my own swimsuits from them, and I love their stuff. I just couldn’t find much at this point in Emily’s size. You want to buy these early – like before the season begins! Jessica Rey Swimwear – These are SUPER CUTE, but a little pricey for us! Primary.com – These look great too, but my fashionista daughter did not go for these basic solids. Friends, I hope you’ve found these links helpful if you’re in the market for some swimwear that covers and protects your girls. Let’s refuse to give away our kids’ innocence and modesty just because appropriate swimwear isn’t in stock at Target. Check out these awesome companies whose clothing shows respect to our daughters. And I’d be so grateful if you’d share this post with a mom-friend! Awesome collection for children. Keep on posting. I am also behind the more modesty movement! We have two red-headed, fair-skinned sunburns waiting to happen. We have always gone for the shorts/shirts surf suits or board shorts and shirts. Sun protection and modesty! Our oldest daughter had to be resuscitated at birth, and in that moment God told my husband that modesty would be her strength and power. Far be it from us to let her wear something that would dis-empower her to walk God’s path for her life! Thank God for modest options! I am so sorry to hear about your husband. I am amazed to hear how you took that experience and made it into something where you’re helping so many! I will certainly let our Costcos know that we miss being able to buy your suits in store. And I will be emailing you shortly! We had the UV skins for both my son and daughter last year. We liked them and would buy them again.